Philip Gross was born in Delabole, north Cornwall, as the only child of a wartime Displaced Person from Estonia and the village schoolmaster’s daughter. He grew up in Plymouth, raised his family in Bristol, and spent many years as a freelance writer, leading workshops and visiting schools. He lives with his wife Zélie in Penarth, and since 2004 he has been Professor of Creative Writing at the University of South Wales where he leads the MPhil/PhD in Writing programme. He is a writer of many parts – spanning poetry, thought-provoking fiction for young people, opera libretti, radio short stories and plays. 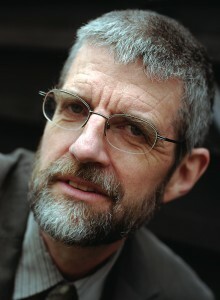 His poetry up to and including the Whitbread-Prize-shortlisted The Wasting Game is collected in Changes of Address (2001). The Water Table won the T. S. Eliot Prize 2009. Deep Field, a PBS Recommendation in 2011, dealt with his father’s aphasia, his exile and with voice and language itself, explorations continued in Later (2013). A new collection Love Songs of Carbon comes from Bloodaxe in 2015, as well as a collaboration with artist Valerie Coffin Price, A Fold In The River, from Seren. Collaboration with the visual arts, dance, music and other arts has been one of the sources of energy in his writing life. I Spy Pinhole Eye, with photographs by Simon Denison, was the English-language winner of Wales Book Of The Year 2010. He has published ten novels for young people, most recently The Lastling and The Storm Garden. His children’s poetry includes The All-Nite Café which won the Signal Award, and Off Road To Everywhere, winner of the CLPE poetry award 2011. His academic writing explores creative process, as in ‘Then Again What Do I Know: reflections on reflection in Creative Writing’ in Marggraf Turley, R. (ed), The Writer in the Academy (2011), and ‘Caves of Making’, in Chatterjee, A, (ed) Creative Writing: Writers on Writing (Professional and Higher: Creative Writing Studies, 2013). He is a Quaker, and questions based in that experience of words and silence underlie a good deal of what he writes.